SOBRIETY : What's the best Path? You know what to say. It’s the standard, “I’ve had enough, I want to change my life, I know what to do, I just need to do it.” You come across as self-possessed and confident, but the thing is, you know you really need some help. And you need someone with as strong a personality as your own. You hate being challenged, but deep down you know you really need it, because usually, you are just able to bulldoze other people. and substance abuse doesn't need to be an option. Some struggle with substances and some don't. It's a simple reality. I've worked with people long enough to know the difference. I also know that we can overcome our struggles and Be Our Best Selves. You CAN overcome any obstacle through understanding yourself and changing your thinking. That's right. One can abuse a substance without that abuse qualifying as addictive. Although the terms are often use interchangeably they are distinct from pone another. Some treatment will be similar depending on the individuals presentation however the goals and outcomes of counseling and therapy may look very different. The evidence-based practice of Motivational Interviewing is used to guide you towards understanding the role of substances in your life. How have they benefited you? How have they harmed you? What consequences have you faced? All with the goal of helping you to move towards positive decision making. Positive change is elicited through the understanding of discrepancies in your current lifestyle and your core values and beliefs. Knowledge of your intrinsic motives and values allows you to focus on behaviors that are conflicting or inconsistent and commit to change. When we identify what we truly believe in we are more likely to walk in the direction of our desires. Services are also offered for the families of those in active addiction and recovery. Many neglect the fact that the user is not the only person trapped by the substance of choice. When the addicted struggle, they family struggles. 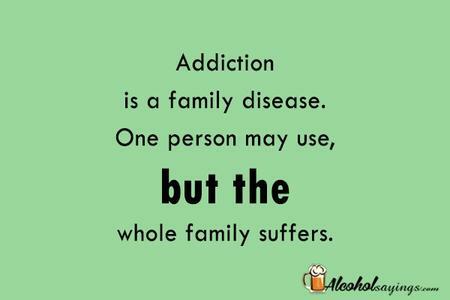 When the addicted are in recovery, the family is in recovery.